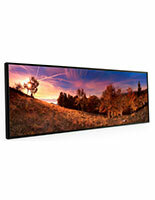 What makes commercial panoramic photo frames a beneficial addition to the countertop or wall in an establishment? The wide holders accommodate custom signs and prints that simply will not fit into traditional framing options. Borders for wider images expose all of the attractive details in the graphic to viewing audiences. Sign holders come in many different sizes, so customers will have no problem finding a model that will hold the film. 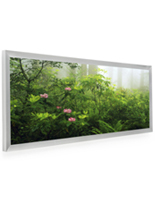 These tabletop standing and wall mounted panoramic photo frames, also referred to as panoramic picture framing, are available in vertical and horizontal orientation to best present the contents. Consumers are much more likely to respond to the graphics when the images are stored in displays of the appropriate dimensions. 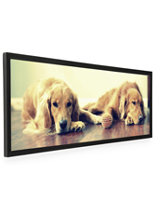 Wall mounted and countertop borders come in various styles to match the décor of the home, office or store. 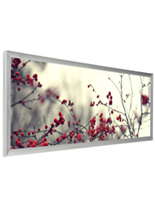 These panoramic photo frames are sign holders for wide prints with wooden, metal and frameless designs for a lightweight, but durable, presentation tool. Different finishes, such as black, silver and natural wood, are in stock to coordinate with the specific atmosphere. Each of the sign holders takes moments to install. Professional frames come with a clear lens to protect the photography from potential damage. 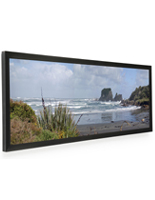 The panorama picture framing often comes with white mats to present different graphic sizes in one display. These frames are a hallmark of versatility and a must have for anyone creating a visually stunning presentation. 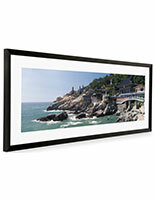 Where are panorama picture frames commonly used? 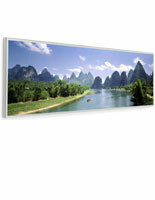 These panoramic photo frames are often found in homes and offices to improve the overall décor. Many talented photographers and artists create attractive works in wide dimensions. These pieces can be wall mounted or installed on the tabletop to set a mood in the cubicle, office, boardroom or living room. Restaurants often feature the black, silver or other color photographic displays to give the dining area a specific aesthetic. The wide set photos not only fill the voids on the walls or counters, but also create a theme within the establishment. Restaurateurs can even use the displays as sign holders to present menus or drink listings to patrons. Framing in wide sizes welcome customers into the establishment. 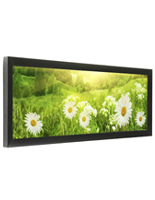 The countertop and wall mounted black displays are a must have for art galleries. It is important for these types of venues to have wide holders on hand because art pieces are typically made in custom sizes. Sign displays of this ilk are great for artwork because of the versatility. Curators can insert portrait and landscape images into the fixtures with ease. 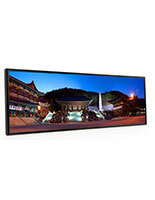 These panoramic displays make loading and unloading images or other content into the units extremely simple. No matter the styles or sizes purchased, the overall setup process only takes a few moments. Most sign holders are back opening, which should be familiar to users. The framing options have tabs in the rear that are opened to remove the backer. Artists place the artwork behind the glass and close the tabs. Wall mounted designs have hooks on the backside for attachment. Countertop models include a backing that supports the framing on flat surfaces. 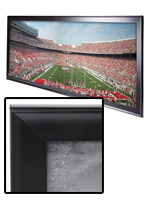 The frameless acrylic styles use magnets to seal the displays shut. Separate the two panels, load in the picture and seal the unit shut. 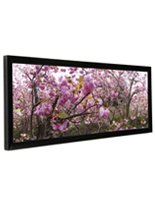 The gallery displays make creating memorable presentations with wide images straightforward and effortless.